In Lesson 7 of the Success Course we mentioned the power of Affiliate Marketing. Today I will show you why you should harness this power – and how to do it, with a reputable well-positioned program. Choosing the right Affiliate program is the first step, and in time Affiliate Marketers may be members of a number of different programs that meet different needs. – Is it worthwhile investing your energy in the program? – Is the program based on REAL products and services and not smoke and dreams? – Does the program offer access to resources that are of real and usable value, that you need and can market? – Can you promote the products and services as a user, not just as a marketer? – How long has the program been established? – Is it well hosted with a minimum of downtime? – Are there testimonials you can check that establish reputation? – Are there statements relating to Privacy and Terms of Service? – Can you be confident of transaction security and tracking? – Is there accessible contact detail that identifies the website or Program owner? – What level of support is offered? – Are products and services of quality and reputable? We see these factors as essential to succeeding as an Affiliate as your identity and credibility becomes linked with the quality and values of programs you affiliate with and promote. The secret to affiliate marketing is not in your ability to market or promote any particular products or services BUT to develop the ability to market and promote YOURSELF. – the program, products, services and resources are your tools. Certainly, you will look for returns in the form of commissions on the products and services that you market successfully yourself. – however, the benefit you obtain from the sale of products and services by others you have sponsored is THE SUCCESS FACTOR in affiliate marketing. 1. To market the PROGRAM to others – who become members of your network and YOUR sales force. 2. To develop a relationship with your network members that goes beyond “making a one-off sale” to them in the form of a referral benefit or commission. 3. To provide support and the benefits of your experience to your network members that is not focused on selling To them, but BY them. From this basic understanding and approach you create your ability to generate ongoing streams of income from a motivated and active network. The final part of this series will discuss how you can create this passive, or residual income through upgrading affiliate membership once you have established the foundations for your success. The AdlandPro Affiliate Program meets and exceeds all the criteria identified as success factors in this topic today, and throughout the Website Success Course. Put “My Success Plan” in the subject line. Here you can review another article about affiliate marketing. Sharing quotes is a favorite pastime for many people on all the social networks ( even Google+) and while some argue that they are trite or a way to clutter a stream and while there are those who will argue that the only reason people use them is to gain followers and retweets/shares etc., the reality is we love quotes! When you realize how much time people spend on places like Facebook ,Twitter, Pinterest and other social networks then understanding how social media marketing can help you in your business becomes understandable. For many people, especially those of you who are used to traditional marketing methods navigating this terrain can often be confusing as well as challenging, which is why I have created this course. Social media – what is it really? “Social Media is a technology used across web and consists of online tools and websites that encourage people to interact with companies, brands, and people. Social media is interactive where you can create a two-way of even a group communication stream, where as with traditional media it is a one way stream an example would be television or print newspapers. Now that you have a basic understanding that social media is all about technology, now we can go to social networking. Social networking is about people, organizations, companies ( brands) who are going through the process and practice of interacting with each other through networks ( AdlandPro is a social network) for the purpose of sharing,engaging and collaborating with other people. The wonderful thing about social networking is that because it is so interactive, you can talk about anything and people will talk back to you. When you think of the term “six degrees of separation” and the concept that any two people on the planet could make contact through a chain of no more than 5 other people, then you can look at social networking as a way that helps people make contacts that would be good for them to know and people they wouldn’t otherwise meet. Basically how it works is that you join a social site and invite people that you know – those people invite their own contacts to join and they invite their contacts and the process keeps going for every person.It is safe to say that with the advent social media, people are connecting and have been touched in many ways on a daily basis, from connecting with friends, lost friends, learning the news from all over the world and the way we communicate has been forever changed. As I have just explained social networking is great for entertainment, talking to friends and family, getting the news on any topic you can think of but because you are promoting a business, then you need to learn a new term and that is social media marketing. 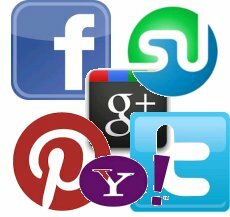 Social media marketing which in easy to understand terms means marketing the social way using different media such as videos, blogs and social networks to give your company/product exposure which will translate into sales, maybe a better way of wording social media marketing is interactive marketing. Just as 90% of people skip TV commercials the reality is that people will tune out any kind of advertising if they think they are being sold to outright through social networking and when you realize that the average person is exposed to more than 3000 advertising messages every day, then you start to see the challenge of social media marketing when it comes to promoting your business. While this may sound very gloom and doom, the fact that you are reading this and taking it all in, means that you are further a head than many marketers out there, who try to treat social media marketing exactly like traditional marketing. Now that you have an understanding between social media marketing and traditional marketing, is there a right way or a wrong way to tackle social media (marketing)? Many Marketers are under the impression that joining different social networks is enough and that the magic will happen in creating leads or making sales and they would be very wrong! To have social media marketing really work for you, you need to learn some basics. There is a tool called Namechk where you can see if your desired username or vanity URL is still available and I would highly suggest you use it to help in your social media planning. 2. Of the three words in Social Media Marketing the most important one is -> Social. Just like offline, social is about conversations and if all your are going to do is sell, then I can guarantee you won’t get very far. Take the time to socialize, be conversational, offer fresh and interesting content. 3. Your Profile is your resume and a business card! Put thought into building your profile and fill every thing in from music to books to your “bragging rights” People want to know YOU. If you are setting up a business profile of any kind, then take the time to present a professional presence. A good question for you to think about is -how do you feel when you go to a profile and all you see is ” Hi my name is xxxx and here is my product to buy” Talk about you first and then put links to your business in the proper places. 4. What are you waiting for? Get active! Make sure to like, follow others who are like-minded businesses,people who share common likes as you, organizations that mean something to you, groups that have the same interests as you. Make sure you are active and participating in conversations. Yes it all takes time, but it is time well spent and really is the best way to earn friends and brand advocates. Make sure you update on all the networks that you are involved in..people really do have short memories! 5. Part of being active is responding to what people are saying. Be generous with your comments, ask questions, leave well thought out comments on a persons blog, forum topic, Facebook post, a twitter message or a G+ discussion. 6. Support your community! Just as in real life, the relationships you form are special. Like in real life there are gives and takers. Create a good balance of giving and taking. A golden rule to follow would be – show support to your network if you expect them to support you! Rule 1: Be REAL! The people on social networks want to see you for who you are. This doesn’t mean they want to know EVERYTHING about you, but they do want to know if you are real. Putting up a facade will not work and don’t do the smoke and mirrors on people. Be transparent and be willing to share. Rule 2: You have to be active before the door slams in your face. Join the conversations and make your voice heard. My next lesson will continue on the journey of social media marketing where I will talk about strategies and social networks. Till next time, read, think and plan on being active. I read a story today from one of the Members of Adlandpro ( Branka Babic) about a petition being circulated called Tobys law and when I read this story, I felt a deep sadness. When we read about all the things wrong with the world and we hear about the cruelty that is all around us its difficult to think of the Law of abundance and yet this is exactly what we need to do.